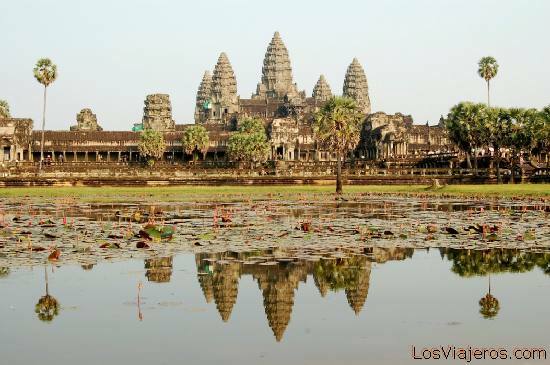 Angkor Wat -Angkor -Cambodia: Impressive view of Angkor Wat, the most important temple of the Khmer Empire, reflected on the water. Fotos de Camboya: Fotografias de un viaje por Camboya o Kampuchea, el país del Imperio Jemer: Phnom Penh, Siem Reap y las ruinas de Angkor. Photos of Cambodia: Pictures of a trip in Cambodia or Kampuchea the country of the Khmer Empire: Phnom Penh, Siem Reap and Angkor ruins.